For many people, walking into a tyre shop can be quite daunting. All the tyres look exactly the same – black rubber hoops sitting on the shelves, but the prices vary wildly, some less than $100 and others well over the $500 mark. So how do you know which tyres to buy? There are many different options to take into consideration when purchasing tyres. What do you primarily use your car for? Do you mostly use your car for city or highway driving? Is your vehicle a sports model or a four-wheel drive? All these questions will play a role in deciding which tyres will suit your needs. The first step is working out how many tyres your vehicle requires. In most cases, replacing the tyres in pairs or a full set of four is the best option. If your vehicle is a four-wheel drive, it is best practice to replace all four tyres at once, to limit the stress on the drivetrain. Once you have decided on how many tyres to replace, the next step is to choose the size required. The size of the tyres on your vehicle may vary, depending on the vehicle model. Checking on the tyre placard (usually located on the inside edge of the driver’s door, or on European vehicles, it may be located on the fuel flap), for the correct size will help you narrow down the size required. If you cannot locate your tyre placard, you can locate the tyre size on the sidewall of the tyres fitted to your car. The tyre size will be written in a code along the sidewall of the tyre, in a sequence similar to this: P205/65R15 82H. 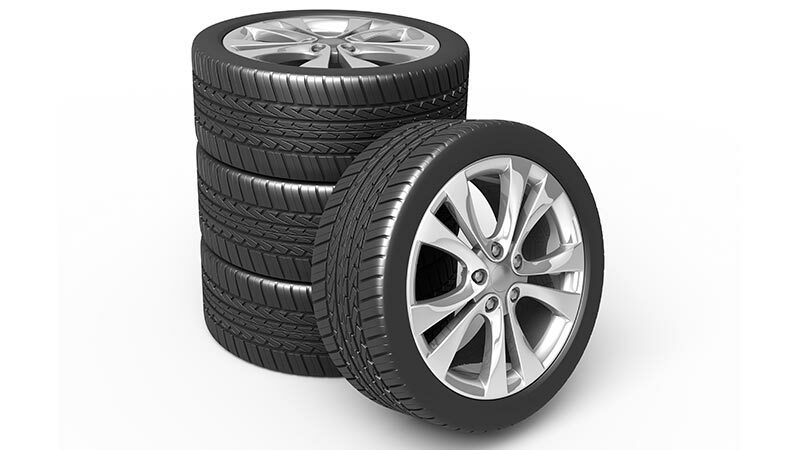 The first prefix indicates what type of vehicle the tyre is intended for. In this case, the ‘P’ stands for passenger tyre. There is also ‘LT’ tyres, which are for use on Light Trucks, and ‘C’ for commercial vehicles. The next set of numbers indicates the width of the tyres, in millimetres. In the example above, the width of the tyre tread is 205mm. The next number is the aspect ratio, or the height of the sidewall, measured in a percentage of the tread width. In the example above, the number is ‘65’ meaning that the tyres sidewall height is 65% of the width of the tyre. The next letter, in the example above, is ‘R’. This stands for radial construction. Almost all tyres will have this letter, as it is the most common construction of modern tyres. The last number in the tyre size, is the diameter of the rim that the tyre fits on. In the example above, the number indicating the tyre diameter is ‘15’, which means this tyre is designed to fit only onto a 15-inch rim. After these numbers, there may be another code, which will indicate the speed rating and load rating of the tyre. In the above example, there is an 82H after the tyre size. In this example, ‘82’ is the load rating, and ‘H’ is the speed rating. It is important to match the load rating and speed rating with what the vehicle manufacturer recommends, as having tyres that are lower can fail and cause an accident or serious injury! On some European vehicles, you may also notice a small circle with the letters RSC written on the sidewall. This indicates that your vehicle is fitted with ‘Run Flat Tyres’. These tyres have a much stiffer sidewall, which allows the driver to continue driving to a safe location even when the tyre has deflated. If you are replacing tyres on these vehicles, they MUST be run flat tyres, as fitting normal tyres to these vehicles will affect both ride quality and the safety of the vehicle. Once you have all this information, it’s time to pick a tyre that best suits your driving style and conditions. This depends on your car type and usage, and the budget you have available. As a rule of thumb, it’s best to purchase the best quality tyre that you can afford. More expensive tyres from reputable brands are usually more fuel efficient, have better durability and are longer lasting than the cheaper alternatives, as well as not producing as much road noise. The tyres on your vehicle are the only contact patch you have with the road, so using quality tyres will increase the performance of your car, especially in wet and slippery conditions, and ensure safe motoring for you and your family. Finding a passion for cars from a young age, Joel carried out work experience as a mechanic whilst at school before starting an apprenticeship after finishing year 12. After almost 10 years on the tools and in customer service, he moved into the IT realm as a Data Analyst and In-House mechanic at AutoGuru.